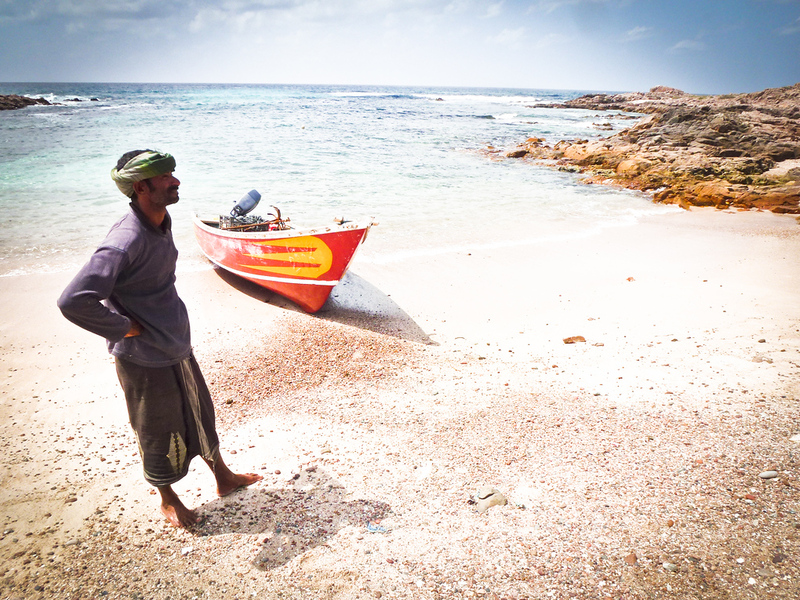 In the middle of the Arabian Sea off the coast of Somalia’s pirate waters, is the Yemeni archipelago Socotra. 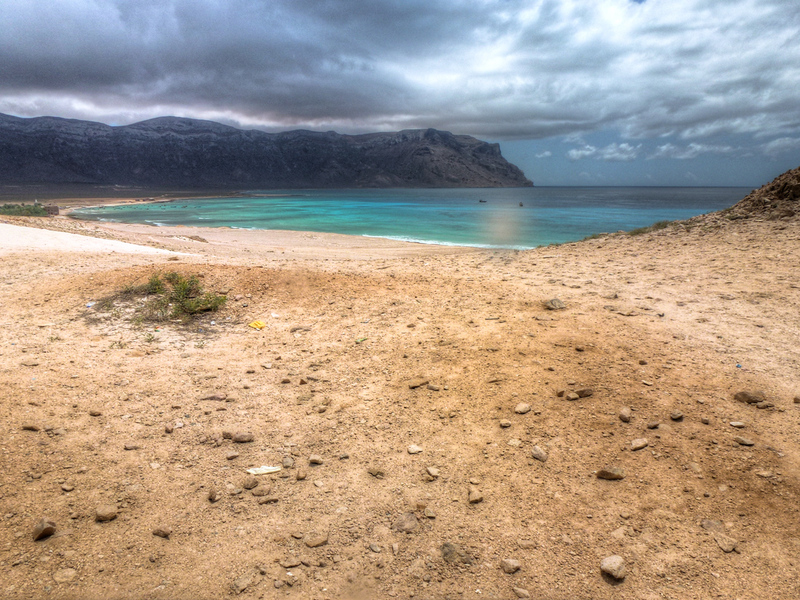 Of its 4 islands, the main Socotra island is one of the most remote, visually stunning, culturally intriguing, and least visited places on Earth. 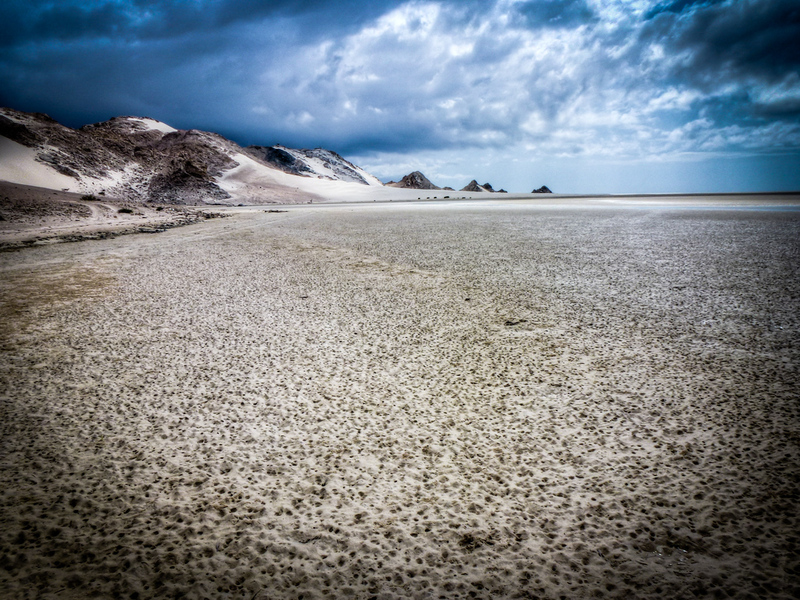 You might be wondering is it safe to visit Yemen – and while that’s a bigger question – the answer for Socotra is a flat yes. 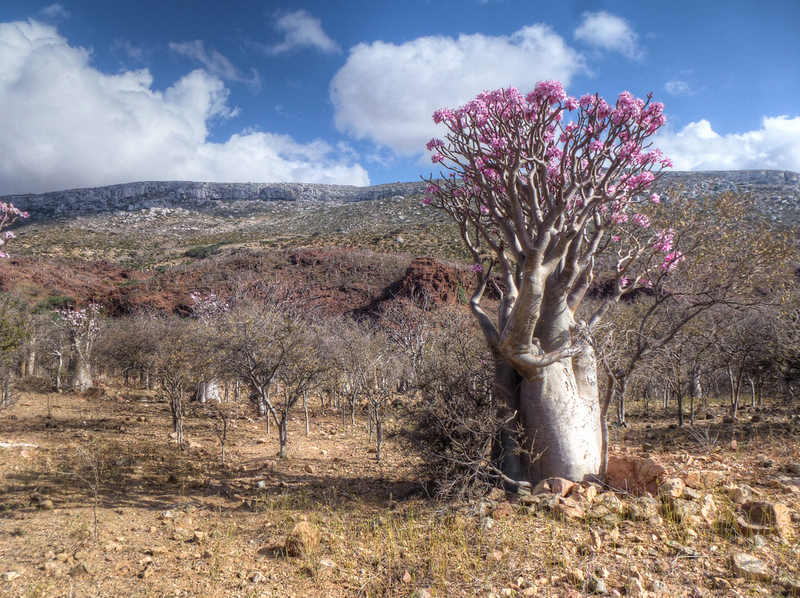 Socotra isn’t the easiest place to get to but a few irregular flights don’t correlate with an expensive trip. 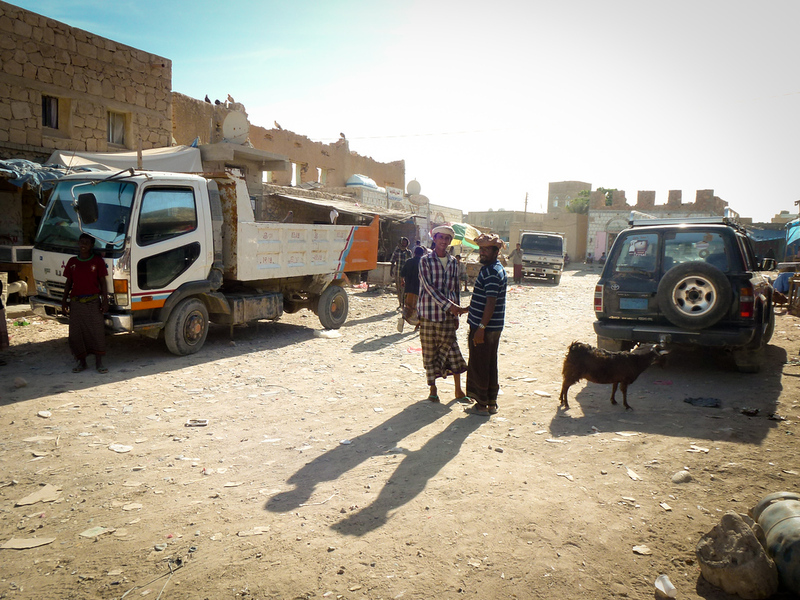 Being Yemeni territory and the nominal connection to the mainland has hurt a Socotran tourism industry that’s never properly gotten off the ground. Only 4,000 tourists visited in 2011 which means many of the world’s travelers are missing one of the best reasons to visit Yemen. 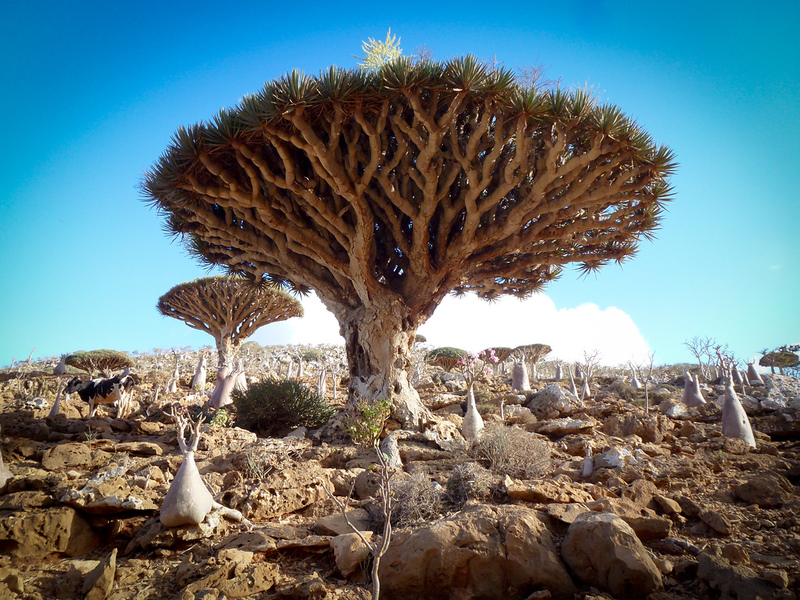 If there were a mascot for Socotra, it would be the dragon blood tree (Dracaena cinnabari). 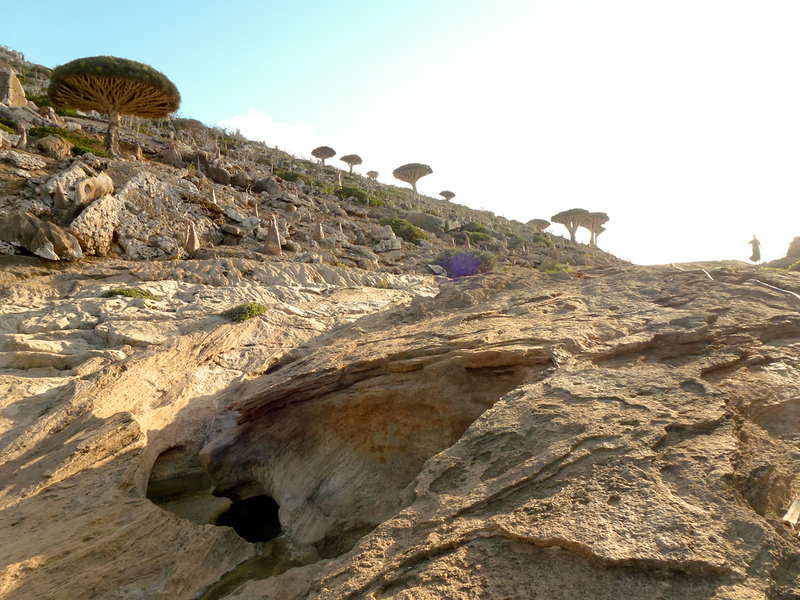 Throughout Socotra’s interior, dragon blood trees grow all over sharp cliffs and rolling hills. Their “blood”, red resin from the tree, is used locally to cure a number of medical problems – remedies famous even to the ancient Greeks. 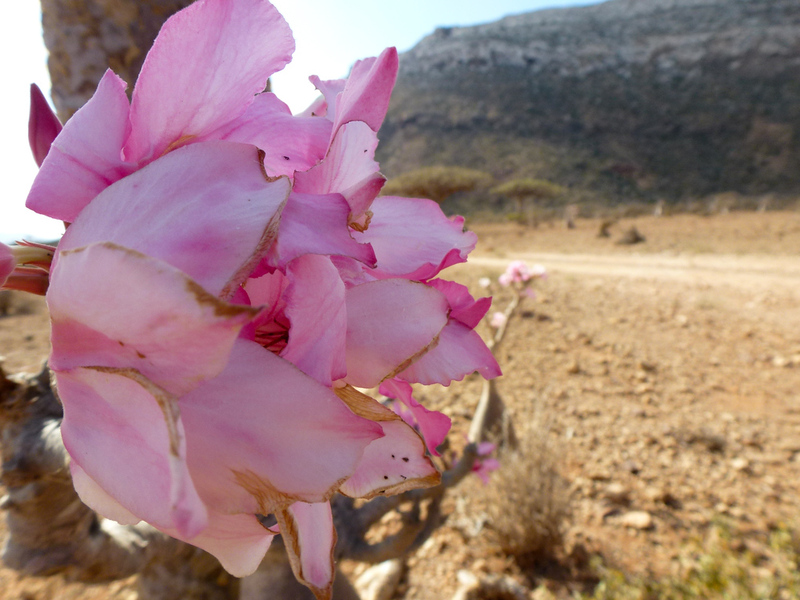 The pink flower of a bottle tree (Adenium) – one of three hundred species of plant that can only be found here. A grown bottle tree, about 2.5 meters tall (~8.2 feet). They begin flowering when they’re quite short so I didn’t have to climb this one to get a nice flower closeup. 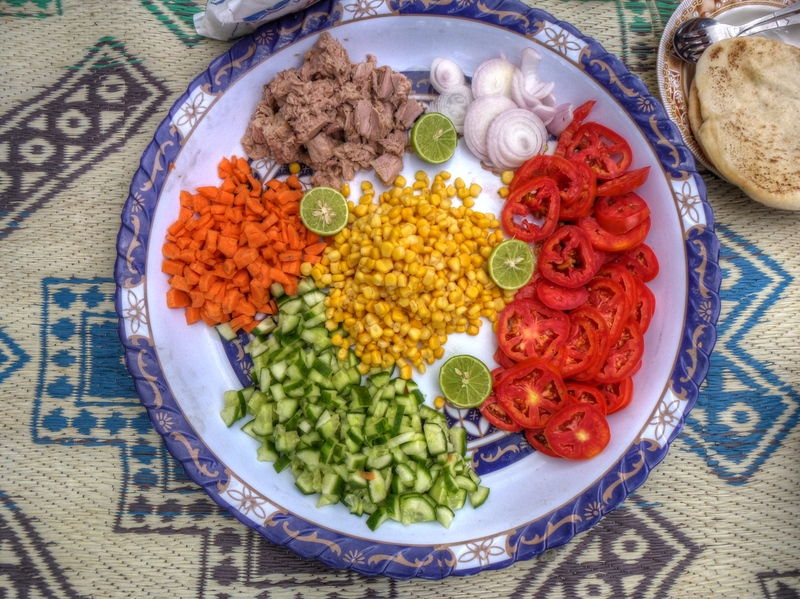 Meals in Socotra are a simple matter eaten with hands, preferably under shade, and often in the company of good conversation. Though unlike a good raki night, there’s no alcohol around. Socotris are strict Muslims. 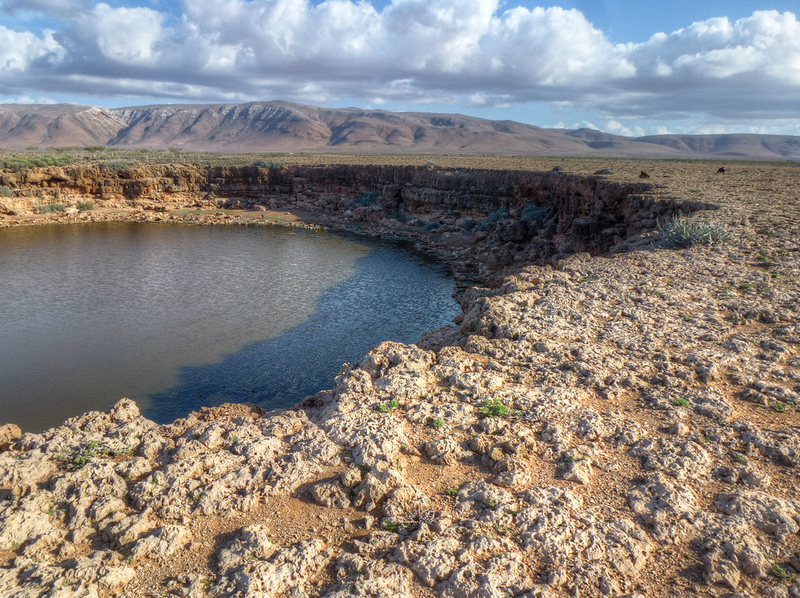 Although Socotra is a part of Yemen, Socotris have a distinct culture set apart from the blend of African, Indian, and Arab influences surrounding it. 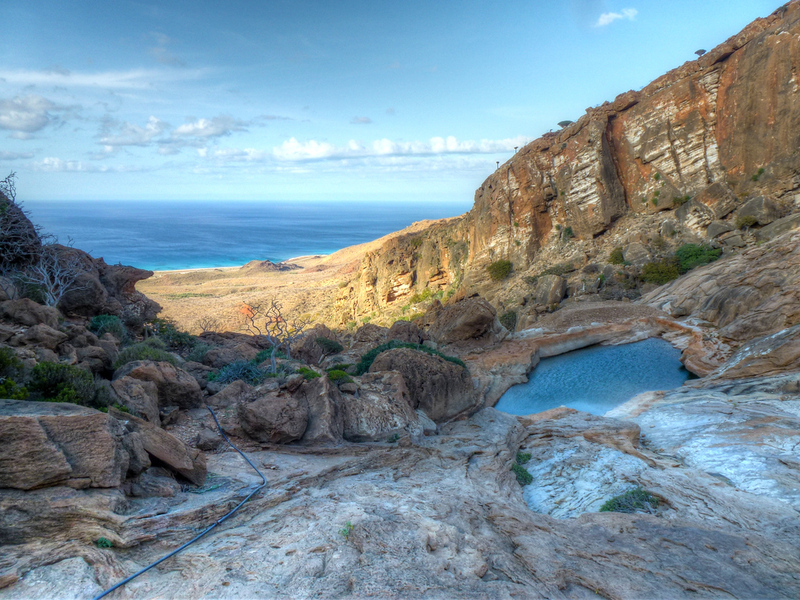 Not technically required, visiting Socotra without a guide you’ll likely end up missing local hiking trails, plants that only grow in one square half-kilometer in the universe, as well as hidden pools to cool off during the hot days. Annual temperatures average in the high 20s Celsius (mid-80s Fahrenheit) with humidity 70% or higher. For a guide, I can highly recommend Saaber Aamer, pictured above (email: [email protected] tel: 00967-771-969-576). 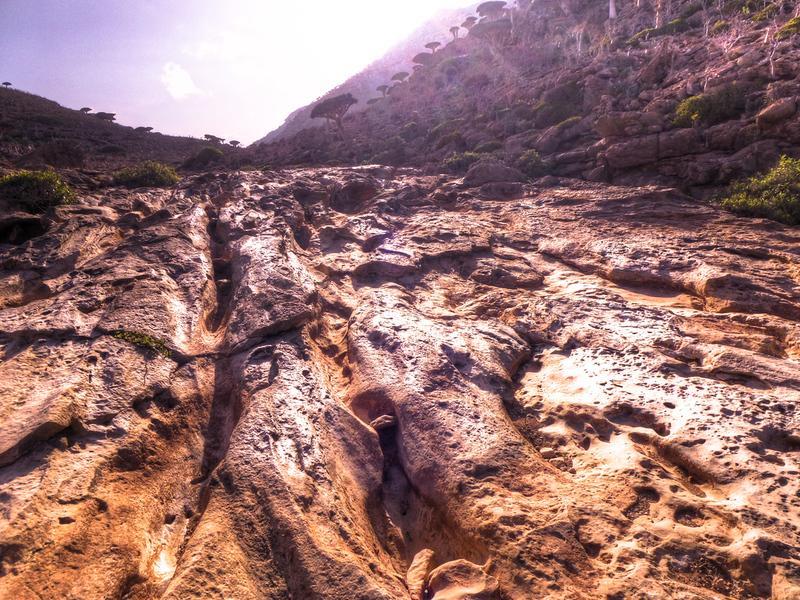 The remnants of ancient lava flows roughly 5 million years old in Socotra, which is located between the Arabian and African tectonic plates. 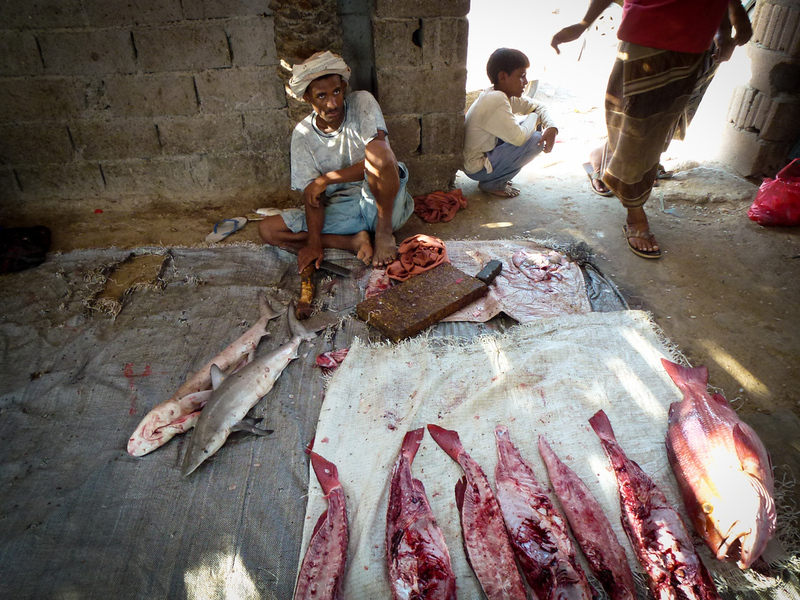 As you can imagine, fish is a staple food on Socotra. 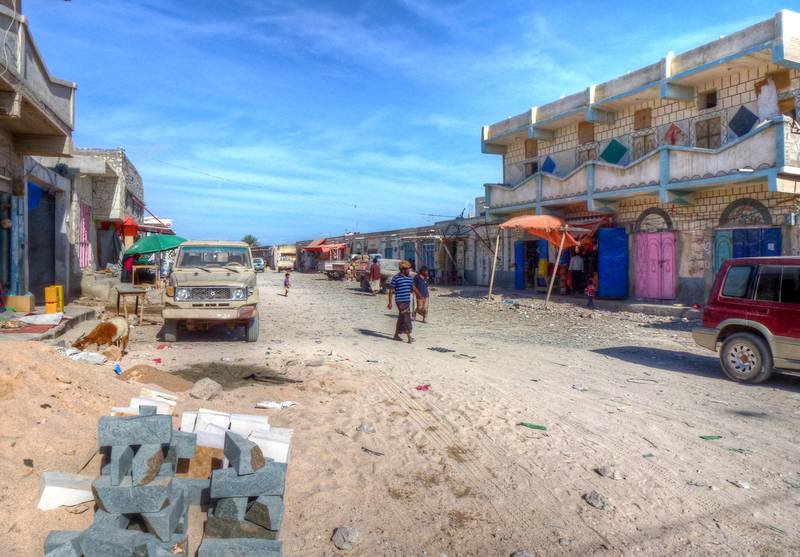 There aren’t a lot of people in Socotra and only one settlement you could call a city, is the capitol (called Hadibo) near the airport. Everywhere else there are tiny town, where there’s not a lot going on. Most Socotris live in the countryside. The way to make a living is by fishing or through tourism. 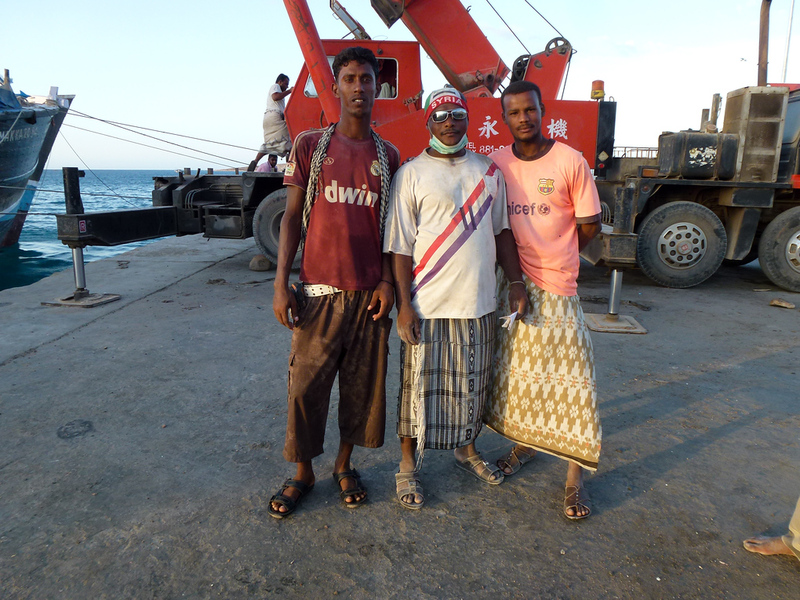 Workers at Socotra’s only harbor. 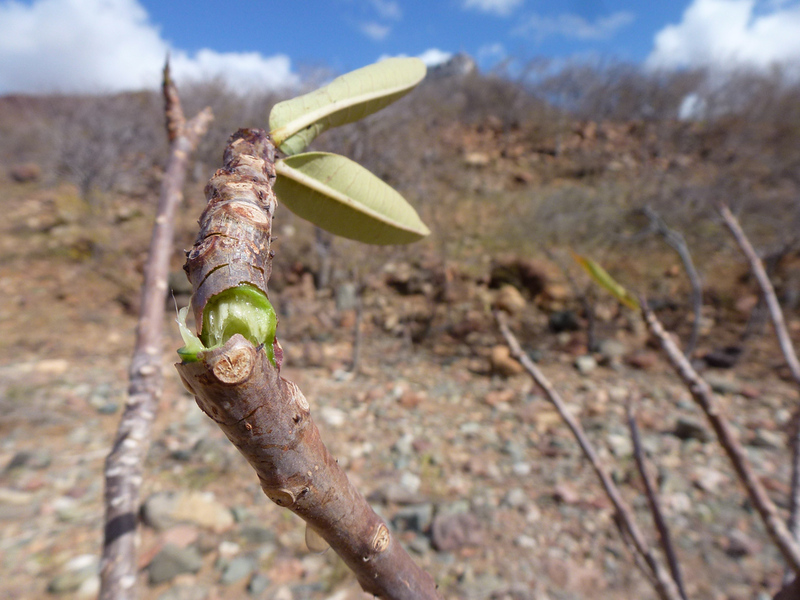 There couldn’t be a more nondescript plant on Socotra but the healing powers of its sap are known to locals; put on cuts it has a mild pain relieving effect. 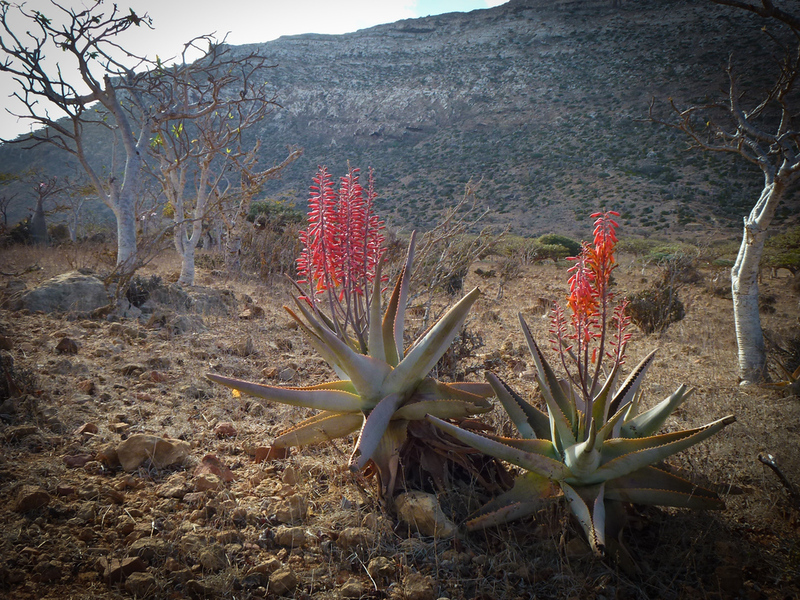 These aloe perryi plants might be one of the reasons Alexander the Great wanted to conquer Socotra 2,400 years ago. Although Hurghada, Egypt is one of the best places I’ve snorkeled in the world, Socotra is a close second. The fish don’t expect to see humans which gives you the opportunity to see a lot of curious sea life up close. An endangered Egyptian vulture takes a break from the heat. There are only an estimated 21,000 mature adults left in the world and the population of Egyptian vultures has fallen by half over the last decade. A large lake I’m told you can climb down into for a better look. I’m still not convinced it’s feasible. Sand with pockmarks from a light rain shower along a beach where the water comes up only to your ankles 5oo meters inland. The most remarkable part of Socotra is how much it makes you feel like you’re on the edge of Earth, far from problems and Internet connections in a little explored piece of the world. Eventually the tourists will come, inevitably changing what Socotris themselves want to preserve about what makes Socotra so special. Socotra is definitely one unexpected travel destination you should visit before it becomes a hit – but if you still aren’t convinced – you can take a look at more of my pictures from Socotra and around Yemen here. But please note that there is no Aloe vera on the Island of Socotra. The Aloe shown is Aloe perryi, common name: Socotrine or Zanzibar aloe. Thank you very much for pointing that out. I double checked and will make the change now. Thanks again. The landscape looks pretty amazing. The scenery and flora just look otherworldly. I’ve read about this secluded island once before and have always wanted to attempt making the trip over one day. Thanks for now refueling my desire to travel there by taunting me with these amazing pics! Great photos Anil! I’ve been itching to get to Socotra and tried to get there during my stopover in Dubai, but I just didn’t have enough time! Thank you Aaron and it probably works better for when you eventually get there, why rush such a place! Wow, this is really off the beaten track 🙂 Socotra looks wonderful, thanks for sharing. Great photos, Anil. It seems to be an otherworldly desert forest. Beautiful! Thanks for the travel inspiration. Socotra is now on my travel bucket list, for sure! Great pics and eloquent post …beautiful place. I think this is what the moon would be like if it had atmosphere, water, people, etc. I was here for good 8 days in February, and i am looking forward for my second trip.. but its hard to convince others to join me due to the Yemen instability.. despite telling them to go via Felix (UAE) then we can bypass Yemen mainland.. I think that keeps so many people away, which is a shame. Both geographically and from a security perspective, there’s a lot of distance. Did you visit the mainland as well? 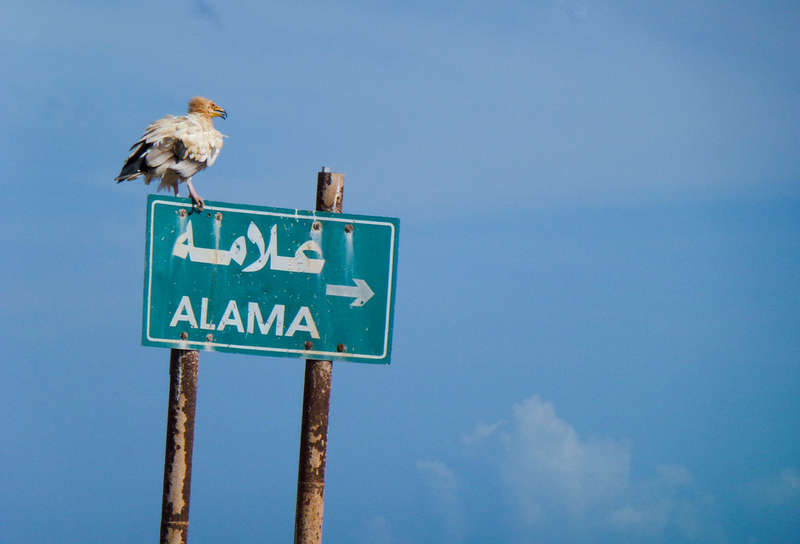 It’s fortunate that Socotra is so far (for now) from any chaos. Have a look at the chapter on Soqotra in the book Sanctuary: Global Oases of Innocence. Thanks Christine, happy to introduce you to this really wonderful place. Awesome, unbelievable place! I can’t remember how often I stared at the map on my wall, looking straight at Socotra.